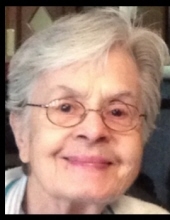 Lillian L. (Lemay) DeSimone, 89, of Ludlow, passed away peacefully on January 19, 2019. Born in Holyoke, daughter of the late August and Celeste (Peloquin) Lemay, she came to Ludlow in 1956. She worked in the Ludlow School System for many years until her retirement in 1983 and was an active and devoted communicant of the former St. Mary of the Assumption Church. Lillian was the beloved wife of the late Anthony DeSimone who predeceased her in 2002; a loving mother to Anthony DeSimone, Jr. and wife Pamela, of Somers CT, Michael DeSimone and wife Shirley, of Ludlow, and Debra DeSimone, of North Carolina; a cherished grandmother to Lindsay, Jamie, and Nichole and her children; a dear sister to Lorraine Proulx, of Southampton, and the late Annette Monfette; and also leaves many loving extended family members and dear friends. At her request, funeral services for Lillian were held privately by her family in Massachusetts Veterans Memorial Cemetery in Agawam. Donations may be made in Lillian’s memory to St. Jude’s Children’s Research Hospital (St. Jude.org). To send flowers or a remembrance gift to the family of Lillian L. (Lemay) DeSimone, please visit our Tribute Store. 1390 Main Street Agawam 01001 Ma. "Email Address" would like to share the life celebration of Lillian L. (Lemay) DeSimone. Click on the "link" to go to share a favorite memory or leave a condolence message for the family.